Allergic reaction may result from consuming the skin or pulp of green or dried figs, from the commercial extract of figs or from fresh fig fruit. It is also possible for a sensitivity to be caused by inhaling pollen from figs or fig trees or by touching the fruit. Some people are sensitive to the latex from unripe figs and any part of the tree. Indigenous to western Asia, the fig tree has been cultivated for centuries and traced back to Neolithic sites as early as 5,000 B.C. More than 700 varieties of fig trees are grown as ornamental plants, for their fruit, or for their rubber. The pear-shaped fig fruit is actually a swollen flower stalk. It can be eaten fresh and raw, peeled or unpeeled. Figs are commercially canned and dried for use in jams and baked products, such as pies, puddings, cakes and bread. 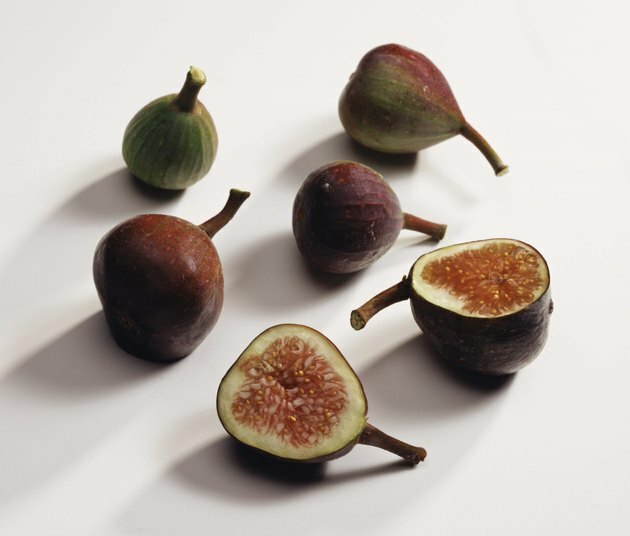 Skin contact with figs or fig plants can cause an allergic reaction in hypersensitive people. The leaf and root sap of the fig tree typically causes more allergic reactions than the unripe fruit and other parts of the tree. This may be due to the presence of psoralen and bergapten, which have the ability to produce phototoxic dermatitis. The handling of the latex of unripe fruit, used to make meat tenderizer, render fat and clarify beverages, may also trigger allergies. Fig harvesters, packers and workers in the food industry are especially prone to this form of sensitivity. Although many of the allergens in fig extracts are lost by heating, some people are allergic to all forms of figs. When the fig is eaten, the skin may be more responsible for allergies than the pulp. Those allergic to figs are likely hypersensitivity to all members of the Moraceae family, which include banyan, breadfruit, mulberry and Osage-orange. Fig shares some common antigens with grass, birch pollens and weeping fig, or Ficus benjamina, and some fig allergies are attributed to this cross-sensitivity. Researchers at the Floridsdorf Allergy Centre in Vienna, Austria studied the cross-reactivity between figs and other allergens. Among the group allergic to birch pollen, 78 percent were allergic to fresh fig and 10 percent to dried fig.They also reacted to mulberry, jackfruit, Rosaceae fruits and hazelnut. Fresh figs were not as well tolerated as dried figs. Patients with an allergy to Ficus benjamina had an 83 percent allergic reaction to fresh fig; 40 percent to dried fig. Ingesting figs can cause allergic symptoms that may include sneezing or coughing, sore throat, stuffy nose, abdominal pain and colic. People who have a low tolerance to salicylates found in the latex from figs may experience asthma-like symptoms, headaches, nasal congestion, itching, skin rash or hives, swelling of the hands, feet or face and stomach pain, according to Cleveland Clinic. In severe cases, anaphylaxis can develop involving a severe drop in blood pressure, loss of consciousness and even death. What Are the Health Benefits of Eating Chestnuts?